Day 2 of the All-Nigeria Athletics Championships was full of intrigues and surprises as Peter Tega Odele claimed his first national title in the 200m and Amaka Ogoegbunam emerged 400m Hurdles champion. In the absence of Mark Jelks- the defending champion in the 100m- Ogho-Oghene Egwero was favoured for the sprint title but stopped shot of victory, as Seye Ogunlewe outlasted a stellar field to his first national title in a season’s-best-equalling time. Ogunlewe’s 10.19secs time saw off stiff competition from Egwero and Jonathan Nmaju in second and third places returning 10.21secs and 10.33secs on the clock respectively. Former champion Obinna Metu (10.35secs), Athletics Federation of Nigeria (AFN) Golden League winner, Nicholas Imhoaperamhe (10.37secs), Odele (10.40secs) and Patrick Ike Chinedu (10.42secs) followed suit in that descending order. It was however a bad day in office for 2014 runner-up Monzavous Edward, who was disqualified for false start. Odele went on to make up for his 100m disappointment with victory in the 200m. The Business Administration student from University of Benin set a new Personal Best of 20.47secs in claiming the 200m as Metu and Egwero again failed to ignite, finishing second and third in 20.57secs and 20.60secs respectively. Odele, who could not hide his joy after crossing the finish line at the Warri City stadium, has now run the Nigerian fastest time over that distance this year; thus, passing the standard mark for selection for the 2015 IAAF World Championships taking place in Beijing, China this month. The women’s 200m was, better still, not spared of an upset, as Praise Idamadudu clocked a Personal Best 23.48secs to see off the overseas-based challenge from reigning 100m champion Gloria Asumnu and Ngozi Onwumere, who posted 23.53secs and 23.74secs times respectively. Patience Okon George also secured her first national title with victory in the women’s 400m. 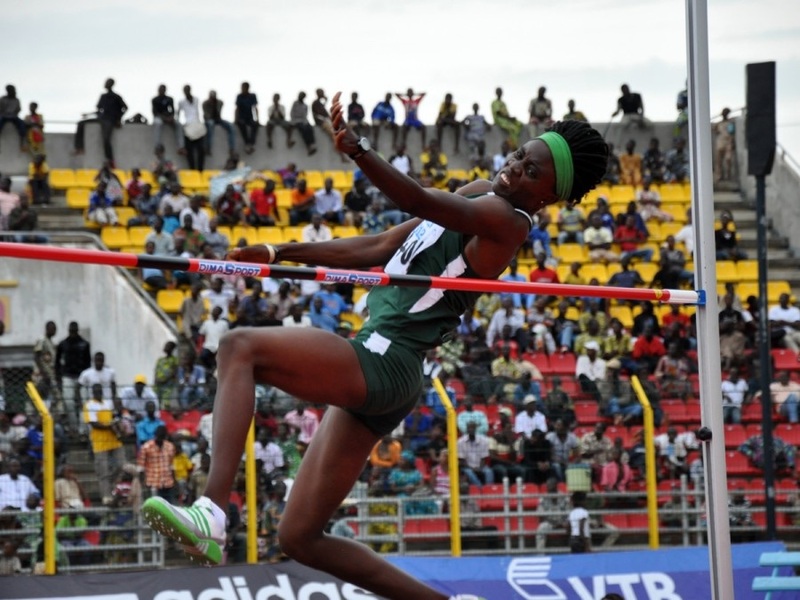 National Record Holder in the Women’s High Jump Doreen Amata Win Her Event at Nigerian Trials 2015. Regina George was almost matching Okon George for speed in the final sprint, but just could not gather her acts together in the closing 10km with the latter eventually showing her competitors pair of heels en route to a 51.31secs time. Regina occupied the runner-up berth with 51.65secs and Margaret Etim claimed third position with 52.64secs. Rita Ossa (52.84secs) and Tosin Adeloye (53.14secs) completed the top five ranks. All five athletes will have their sights on major improvements ahead of the World Championships. Chidi Okeze caused another upset in the men’s 400m with a 46.17secs time to beat home-based athletes Nathaniel Samson and Noah Akwu. Samson emerged runner-up with 46.20secs time, while Noah took home bronze medal with a time of 46.38secs. Robert Simmons (46.56secs) and Orukpe Erayokan (46.58secs) finished fourth and fifth respectively. Okezie was only making his first visit to Nigeria, having competed for the United States at junior level. He won gold medal for the U.S. in the 4x400m Relay at the 2012 IAAF World Junior Championships in Barcelona. Deborah Pam added the women’s 10,000m title to the 5,000m crown she won on Thursday, following another impressive 36:27.04 time. Onah Saleh won silver with a 36:59.08 time and Aderonke Olumudi finished third. Emmanuel Gang was the winner of the men’s 10,000m event with a 30:13.07 time, as Kefas Williams and Godfrey Monday came second and third in 30:38.20 and 30:53.03 respectively. Uhunoma Naomi Osazuwa set a new National Record of 6106 points to win the women’s Hepthatlon. Oluwakemi Francis finished second with 5406 points and Moe Sasegbon took bronze medal with 5353 points. All-Africa Games silver medalist, Osazuwa, will be representing Nigeria at the World Championships. Ibrahim Baba’s effort of 47.49m was enough to help him take gold medal in the men’s Hammer Throw, as Olatunji Olawale (45.49m) and Ojesebholo Charles (41.65m) claimed silver and bronze respectively. Theddus Okpara claimed the men’s High Jump, leaping over 2.10m height, as Arinze Obiora came second with 2.05m leap, same jump as third-placed Ashipa Abayomi. There was no stopping Blessing Ibrahim from making a successful defense of her Triple Jump title after covering a distance of 13.32m. Hope Idhe (13.11m) and Uche Brown (12.42m) completed the top three apots in that event. National record holder in the women’s High Jump Doreen Amata also had an impressive outings taking the gold medal in her event with a 1.85m jump, ahead of Anigbata Grace (1.60m). Melody Bassey won the men’s Pole Vault with 4.20m effort, as Toma Japo claimed second with 4.00m and Emmanuel Edwin won bronze with 3.60m throw. Samson Idiata claimed gold in the men’s Long Jump with a 7.89m effort, as Ezekiel Ewulo (7.85m) and Oladineji Oluwatoyin (7.81m) finished second and third respectively. Both Idiata and Ewulo have reached the standard marks for selections for the Worlds’, as Oluwatoyin, fourth and fifth-placed Okpara Thedus (7.66m) and Stanley Gbagbeke (7.37m) could be up for probation. Kazeem Adeyemi dominated the men’s 20km race and Faustina Oguh won the women’s event. Kelechi Nwanaga was the winner of the women’s Javelin Throw with 47.32m ahead of Priscilla Priscilla (40.62m) and Obiagheli Mbadugha (36.74m). The World Cup Playoff Round is the Big Test for Eagles- Ameobi. Eagles Set to Play in Front of a Scanty Estadio Mineirao.